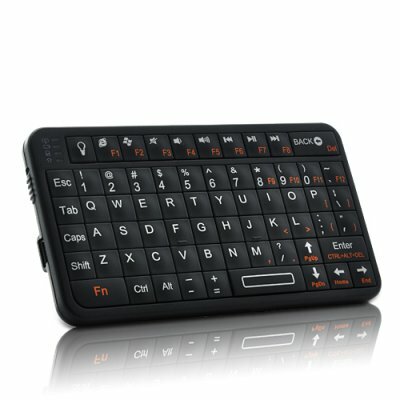 Successfully Added Ultra Compact Mini Bluetooth Keyboard for iPad, Android, PS3 and More to your Shopping Cart. Typing, chatting, and gaming just became easier than ever before with this new Mini Bluetooth Keyboard. This handy accessory is easy to carry around and works with Android devices, iPhone, iPad, iPad 2, Playstation 3 and many more devices, allowing for easy and convenient typing everywhere you go. This easy to use mini Bluetooth keyboard features a full QWERTY keyboard complete with function (Fn) key, F1 through F8 keys, space bar, number keys, Page UP/DOWN keys and more. There are 66 keys in total - making this one of our most versatile mini Bluetooth keyboard to date. The raised backlit buttons make it easy to always select the correct key and it’s so compact and thin (only 10mm) that you can easily toss it in your pocket and forget it’s even there! Why spend more on a brand name mini Bluetooth keyboard when you can own one that’s the same quality, direct from the factory, and at a fraction of the cost? Take advantage of our unbeatable wholesale price and order the Mini Bluetooth Keyboard today while supplies last. And remember, all products from Chinavasion are in stock now and come with our hassle-free full 12 month warranty. Super compact and only 10mm thin! on 2011-09-20 05:34:28 BEST COMPACT BT KEYBOARD ON THE MARKET! Prior to checking out the selection at Chinavasion i made the mistake of looking at a cellphoneshop on the internet promising 80% off accessories. I purchased their compact BT keyboard, waited over a week for delivery and when i received it i was disappointed. The keypad was so flimsy somme of the letters were already rubbing off and the materials were cheap and felt like it would break within a few weeks. So then i checked out Chinavasion and found this Macro BT Keyboard for my iPad2. I received it in 2 business days!!! already i was more impressed than i was with the other guys. When i opened the package right away i knew i made the right choice. This keyboard is built to last and feels solid in your hands. They keys aren't flimsy rubber instead a durable hard plastic and it they're backlit!! anyone who is looking for a compact keyboard for their iphone, ipad, PS3 (those are what i use mine for) then you cannot go wrong with this product! !